At the top right of this screen, a search bar allows you to search for specific media. At the top left your existing media is displayed by type, (All, Image, Video, Audio) to give you a quick reference as to how much media you have at your disposal. These options are identical to the options given when you Add Media From Computer. When you are happy with your settings, click on the Insert into Post button to insert your image inside your post or click to Use as Featured Image link to use the image as the main representation of your post. 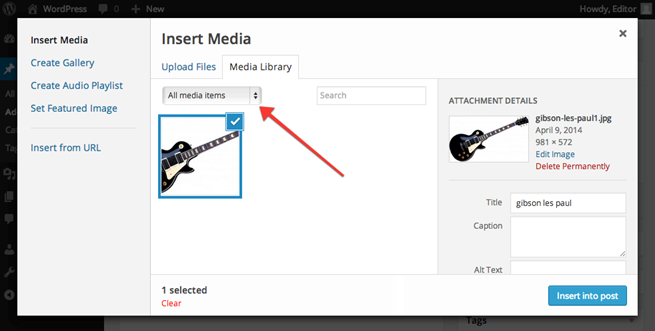 If you wish to make changes to the settings for the files in the media library without inserting any media into your page or post, click on the Save all changes button. 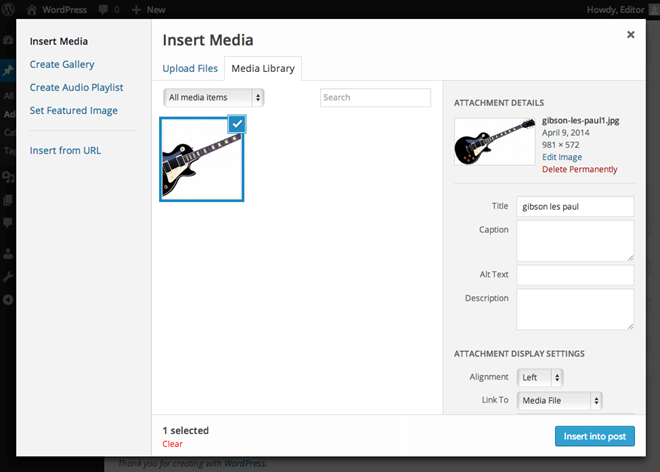 This will remember the changes you have made for the next time you access the media library. Alternatively, if you wish to delete the file from your media library, click on the Delete permanently link.